Russia is losing its faith in Venezuelan President Nicolas Maduro's ability to emerge victorious from the political crisis gripping the country, Kremlin sources say. Moscow still publicly backs Maduro's regime but 'recognizes that the disastrous state of Venezuela's economy is inexorably draining what remains of his public support'. 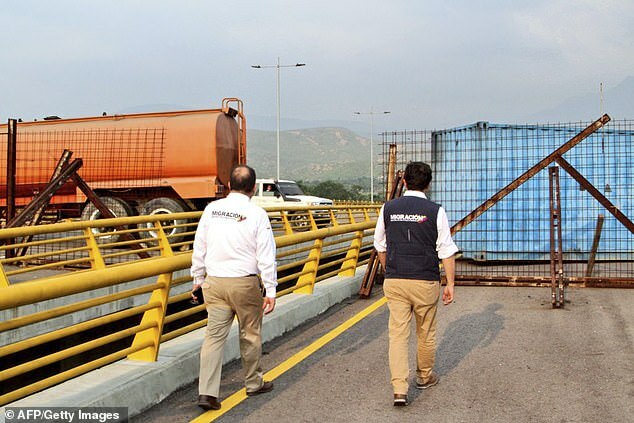 The unidentified sources also pointed out that the army, part of which is currently deployed to block an aid shipment of food and medicine from entering the country from Colombia, will be reluctant to continue crack downs on fellow Venezuelans. 'Unfortunately, time isn't on Maduro's side,' said Vladimir Dzhabarov, first deputy chairman of the international affairs committee in the upper house of Russia's parliament, told the Moscow Times. The staunch support for Maduro from Moscow hails partly from the fact that his regime is heavily indebted to the Russian government, and it is feared a collapse would not see it repaid. Russia is said to have pumped more than £7.7billion ($10bn) into Venezuela through loans as well as investments. Venezuelan state oil company PDVSA is paying back a $2.3bn (£1.8bn) Russian debt via oil supplies, which Rosneft said on Monday they expect them to be able to pay back as they see the current situation in Venezuela as 'temporary'. 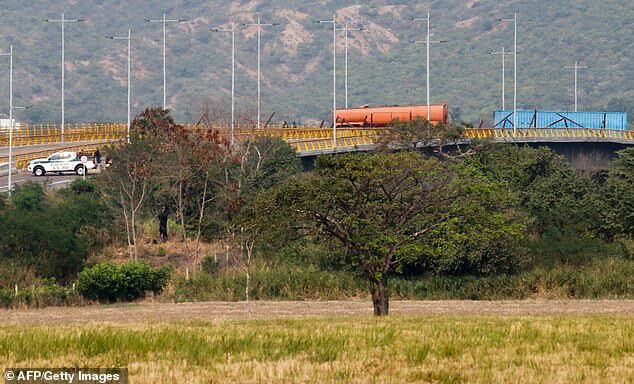 This comes as Venezuelan army continues its blockage of a bridge on the border with Colombia ahead of an anticipated humanitarian aid dispatch. Opposition leader Juan Guaido, now recognised as interim president by the West and the US, claims that up to 300,000 people face death if the aid being blocked by Maduro's army is not delivered. The opposition-dominated National Assembly, led by presidential challenger Guaido, had warned the armed forces that blocking aid would mean crossing a 'red line'. 'You know there's a red line, you know well there's a limit, you know that medicines, food and medical supplies are that limit,' lawmaker Miguel Pizarro said in a message to the military. The aid delivery was being coordinated by Guaido, who has declared himself interim president of the oil-rich country and now enjoys the backing of some 40 countries as Venezuela's legitimate leader. His blockage of food, medicine and necessities to hundreds of thousands of starving Venezuelans came as weapons were discovered in cargo which the government claims was sent from Florida. The weapons, including 19 rifles and high-calibre ammunition, were found at an airport in the city of Valencia, having been transported on an Airbus jet that flew in on Sunday, the Interior Ministry wrote on Twitter. It is not known who the intended recipient of the weapons was. Russian TV Lists Nuclear Targets In The U.S.
Is The EU Project At 'The Beginning Of The End'?